Guess what courgettes/zuchini are great at? That’s right! They are a healthy alternative to noodles for all the same reasons as pasta. And if you think that rice noodles are healthier than pasta, rice is ground finely to make into noodles, and it is this easily-absorbed refinement of grains that makes them so darn spikey on your blood sugar. First, prepare your courgette in the same way as for the pasta recipe above. You can slice them more finely if you like to resemble finer noodles. If using a spiraliser, use the finest cutting attachment. Tip: You can get all kinds of creative with this dish by adding julienned strips of carrot and mooli radish to create a multi-coloured voodle feast. 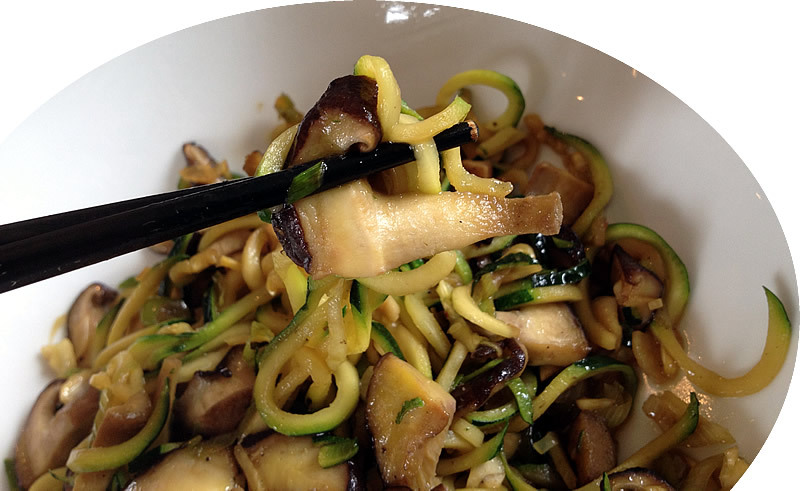 Throw in some chopped cashew nuts to the pan with the mushrooms to add extra crunch.